The Pixel 3 leverages Google’s artificial intelligence in some extremely useful ways, and it builds on the line’s reputation for fantastic cameras. The Pixel 3 is compact powerhouse smartphone that packs a surprising punch. It only has one rear camera, in a world where two or more have become the norm, and it lags behind key competitors in terms of RAM and storage, but exciting implementations of artificial intelligence and some unique design choices help the smaller of Google’s two flagship phone really stand out in what has become an overly crowded field. We recently tested a Pixel 3 to see how the third iteration of Google’s flagship line stands up to real world use. 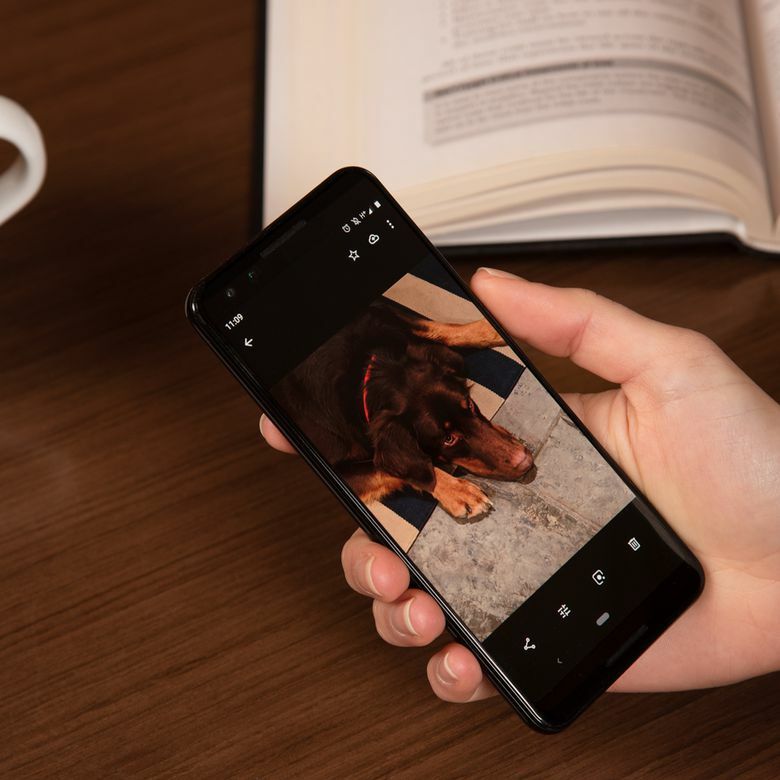 In addition to basics like connectivity and battery life, we paid special attention to AI-assisted features like the new Night Sight mode, which really leaves the competition stumbling in the dark. Design has never really been Google’s strong suit when it comes to in-house projects, but the third generation Pixel phone shows a definite, if not derivative, improvement over the previous model. Thanks to the two-tone etched finish on the back, the Pixel 3 isn’t as slippery as other all-glass phones. The aluminum monster that was the Pixel 2 is gone, replaced by an all-glass design that looks slick and feels great in the hand. And thanks to the two-tone etched finish on the back, the Pixel 3 isn’t nearly as slippery as other all-glass phones. The front of the device leaves a little more to be desired, as the bezel is fairly thick all around. The screen doesn’t have the Pixel 3 XL’s massive notch (or any notch at all), but the screen to phone size ratio is a lot smaller than other handsets. The forehead and chin, where you’ll find the phone’s stereo speakers, are especially large. Overall, the Pixel 3 is a very nice looking phone that also feels good in the hand. It isn’t a big phone, but if you want big, that’s what the Pixel 3 XL is for. The Pixel 3 is not only an Android phone—it’s the archetype of all Android phones. Unlike Android devices from other manufacturers, which can stack unnecessary additions on top of the basic Android software, this is the pure, unadulterated thing. That means the device is pretty much ready to go right out of the box, as long as you have your Google username and password handy. Since the Pixel 3 supports virtual SIM cards, you technically don’t even have to take the time to swap the SIM from your old phone or install a new one. It does include a physical SIM slot if you need it, but it’s nice to have the virtual SIM option. The Pixel 3 features the Snapdragon 845 chipset found in competitors like the Samsung Galaxy S9 and OnePlus 6T, and it benchmarks in the same general range as those devices. The model we tested has 4GB of RAM and 64GB of storage. The first test we ran was PCMark’s Work 2.0 benchmark, which tests how well a phone handles basic productivity tasks like loading webpages, composing emails, and editing both photos and videos. It notched a decent score of 8,808 in that test, which was slightly higher than the OnePlus 6T’s score of 8,527. Drilling down further, the Pixel 3 achieved a fantastic score of 18,880 on the photo editing portion of the Work 2.0 benchmark, and lagged behind in video editing and data manipulation. We also ran some gaming related benchmarks, since the Pixel 3 does have the required hardware, if not the screen size, to play a lot of Android games. First, we ran GFXBench’s Car Chase test, in which it managed a decent 29 FPS, compared to a result of 31 FPS from the OnePlus 6T. It also scored great on the less-intense T-Rex benchmark, recording a much higher result of 61 FPS. In practice, the Pixel 3 stood up to everything we threw at it in day to day use without choking once. The screen is a little small for some games, but we didn’t experience any problems in terms of performance. You may notice a tiny bit of slowdown when performing certain functions with the camera, but that’s more or less to be expected considering all the heavy lifting that Google’s artificial intelligence is doing in the background. The Pixel 3 performed flawlessly when connected to both 2.4 GHz and 5 GHz wireless networks in our testing. It also notched some decent speeds when connected to mobile data in comparison to other phones that we tested at the same time and under the same conditions. The Pixel 3 sports a 5.5-inch, 2160 x 1080 OLED screen, which means you can stream compatible movies from YouTube and Netflix in 1080p HDR. When connected to T-Mobile’s 4G LTE network indoors, our test unit was able to manage download speeds of 4.69 Mbps and upload speeds of 1.33 Mbps as measured with Ookla’s speed test app. A Nokia 7.1 tested at the same time only managed about 4.03 Mbps down. When tested outdoors, with no obstructions and showing full bars, the Pixel 3 was able to achieve download speeds of 37.8 Mbps and upload speeds of 7.23 Mbps. The Nokia 7.1 was slower there as well, only managing download speeds of 18.0 Mbps in the same location. The Pixel 3 sports a 5.5-inch, 2160 x 1080 OLED screen with support for HDR, which means you can actually stream compatible movies from YouTube and Netflix in 1080p HDR. The screen looks and performs great, but the catch is that it’s only FHD (1080p), not Quad HD (1440p). The choice to use an FHD OLED display in the Pixel 3, when competitors have already moved on to Quad HD, is strange, and it’s reflected in the lower pixel density on the Pixel 3 display (443ppi) compared to other flagships like the Samsung Galaxy S9 (570ppi). The Pixel 3’s display does have some tricks up its sleeve though, including a low-power Always-On mode that allows you to check the time, date, and your notifications, without turning the screen on. Since the OLED display allows individual pixels to be turned off, this mode doesn’t hog a lot of battery while delivering you useful information. We mentioned the Pixel 3’s chunky bezel before, including both a forehead and a chin that are a bit wider than we’d like to see from a device like this. That’s where the front-firing stereo speakers are mounted, so the questionable design choice is somewhat forgiven. The sound quality is almost as good as what you would expect from a smart speaker. Phone speakers tend to be on the anemic side, but the Pixel 3 actually sounds pretty good, even when cranked up to maximum volume. The sound quality is almost as good as what you would expect from a smart speaker like the Google Home Mini or Amazon Echo Dot. That’s surprising considering the diminutive size of the Pixel 3. In a landscape littered with dual rear camera phones, and handsets with even more than two rear cameras, Google stood strong with the Pixel 3. There is only one rear camera, and Google makes up the difference with some fascinating artificial intelligence processing behind the scenes. The bottom line is that the Pixel 3 has a fantastic camera, which machine learning and artificial intelligence only serve to improve. Some of the most important features include Top Shot, which takes a series of snaps and automatically finds the best one, Super Res Zoom, which obviates the need for an optical zoom, and a Night Sight mode that takes truly remarkable photos in extremely low light conditions. Unlike the rear camera, which stands alone, the Pixel 3 actually has two cameras on the front. This is mainly to support wide angle selfies, allowing you to catch more of whatever you’re standing in front of, or the people you’re with, without needing a selfie stick or a kind stranger to take the snap for you. In addition to its fantastic still photo capabilities, the Pixel 3 is also capable of recording 4K video, but it’s still locked at 30 FPS. The Pixel 3 features a 2,915 mAh battery, which is an improvement over the Pixel 2 battery but still something of a disappointment. It’s enough battery to keep the phone going through a full day of light use, but if you get lost down a YouTube rabbit hole you’ll find yourself looking for a place to plug in. We subjected the Pixel 3 to PCMark’s Work 2.0 battery test, and found that it lasts less than 9 hours of active use. That’s with the Wi-Fi, Bluetooth, and cellular connections turned on. With the phone set to airplane mode, you can extend that to about 15 hours. Back in the real world, we never actually had to scramble for a charger while testing the Pixel 3. During the course of a regular day of making calls, sending texts and emails, snapping photos, and otherwise using the phone normally, we never ran out of charge. When Google ditched metal from the Pixel 3’s design, they also brought back the wireless charging that had been absent from official Google phones since the Nexus 5. That means you can charge a Pixel 3 with any Qi wireless charging mat, but there’s a catch — Pixel 3 supports fast wireless charging, but only when you set it on the official Pixel Stand (a separate accessory). The Pixel Stand is more than just a charger, though. When you set a Pixel 3 on a Pixel Stand, it unlocks a mode that essentially turns the phone into a Google Home. This is a nice touch, although it would have been even nicer if it kicked in with third party wireless chargers as well. The Pixel 3 ships with stock Android Pie. This is the purest Android experience you can get, and it looks great. The gesture controls might take a little getting used to, but the Pixel 3 is Android as it’s meant to be experienced. One of the biggest selling points of the Pixel line is that it receives updates before other Android phones. Any time there is a security patch, or a new feature, the Pixel 3 will see it even before phones in the Android One program, let alone other non-Google devices. In addition to receiving updates in a timely fashion, the Pixel 3 is guaranteed to receive major software updates for a minimum of two years and critical security updates for three. That means with the Pixel 3, you can expect to enjoy new features and innovations for at least a few years. The Pixel 3 is available in two configurations, which are differentiated by the amount of storage space. The 64GB model has an MSRP of $799, and the 128GB model has an MSRP of $899. That represents a significant increase over the original cost of the Pixel 2, but it’s competitive with other current flagship phones. The Galaxy Note 9, for instance, has an MSRP of $999.99 for the unlocked version, and only matches the Pixel 3 in price if you go for a carrier-locked version that ties you into a contract. Other competitors, like the OnePlus 6T, beat the Pixel 3 on price hands down. The OnePlus 6T has similar specifications, including screen size, to the Pixel 3 XL, but it sells for just $549 in its least expensive configuration. The Pixel 3 has similar specifications and performance to its competition. In most meaningful metrics, including price, the Pixel 3 stacks up favorably. It has a unique look and feel thanks to the two-tone textured glass back, plus it has access to a lot of cutting edge features that Google hasn’t released to the general Android world yet. Where the Pixel 3 really shines in comparison to the competition is the camera, so if you’re looking for an Android phone that’s capable of taking truly fantastic shots, Pixel is still where you want to be. Competitors like the Galaxy S9 Plus, and even the OnePlus 6T, have closed the gap, but the Pixel 3 really has inherited the title of best phone camera from the Pixel 2. However, if you need a phone with a fantastic battery life, you may need to look elsewhere. Despite having a slightly larger battery than the Pixel 2, the Pixel 3’s actual battery life hasn’t improved over its predecessor. Competitors like the Galaxy S9+, iPhone XS Max, and even the OnePlus 6T, can all keep going for hours after the Pixel 3 powers off. Check out our other reviews of the best smartphones available on the market today. The Pixel 3 is an improvement over the Pixel 2 in just about every way, and it’s the best Android phone you can buy in terms of access to cutting edge features. You can save some money by going with a challenger like the OnePlus 6T, but the Pixel 3 provides an unfiltered Android experience, with the promise of years of timely updates, that you just won’t find anywhere else. Product Dimensions 2.7 x 5.7 x 0.3 in.